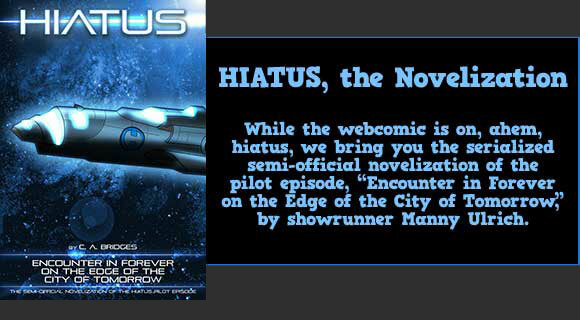 Save Hiatus » Archive » Pre-mutiny. On ice! The lighting effects for the spacewalk near the second sun of Remus Delta required so much power that the FX department inadvertantly caused a citywide blackout. Director April May shot the scene in total darkness with a hand-cranked camera so production wouldn't be held up and they could all clear out before the police arrived. “Thanks,” the man said. “Sign here, please.” He thrust a small pad at her and stood waiting. ParSec looked at Chavez, who shrugged. She signed the pad. “Great, hang on.” He folded himself back through the hatch, in stages, and then backed out again while dragging a large box. The box had a frosted front and blinking lights. Blinking lights on a coffin-sized box, in Hy’s personal experience, were never good. “There you go,” the man said, slapping his hands together. The box had tiny wheels on it; it continued to roll a few more inches after he set it down. “You have a good day, now.” And he swung the hatch closed behind himself. Within seconds an engine fired up and the floor shook as the delivery ship disengaged and fell away. ParSec leaned in to peer over his shoulder. “Captain? Ahem, Captain? Captain… what’s his name? They contemplated the box. Through the frosted window a face could just barely be seen. A strong face. Possibly even a noble face. But most of all it was a surprised face, and whatever the surprise had been, it had not been a happy surprise one. They leaned back. “We wait,” ParSec said. Hy straightened up and brushed off her slacks. “You know, we could reset the timer. No, no, hear me out,” she said, trying not to giggle at the horrified look on ParSec’s face. “Just think how effective a frozen captain would be! He’d always give the orders we’d want to hear! Through this litany Lt. Commander ParSec’s face had cycled through some interesting colors of its own. When she took a deep and deliberate breath, it returned slowly to its normal icy-pale shade, only it wasn’t the friendly, let’s-go-skating kind of ice. Her face was the ice that children get trapped under, the ice that slowly creeps up over your continent when you’re not looking. “You are talking treason,” she said slowly, multi-ton chunks of glacier slipping into the sea with every word. ‘Yes, we did,” ParSec said, in tones that suggested that the discussion in question had not been complete in and of itself and may in fact have only been Round One. Gradually, cracks formed in the permafrost. ParSec mumbled something. “Understood,” ParSec said, glaring. The two women settled into a glaring match; ParSec had the reach and uniform for it, but Hy was winning on sheer rage. “Hey Hy, can you give me a hand with this thing?” Chavez asked cheerfully. “I don’t take orders. Polite requests often work, though. Consider that as an alternate option, I’m sure it’s mentioned in one of your op manuals somewhere.” Hy bent to help push the crated captain. ParSec stood stock still for a moment, possibly convincing herself that murdering both of them would be wrong and would soil her uniform, and then stormed off. This entry was posted on Friday, October 31st, 2008 at 10:28 pm.